The traffic signal ahead is displaying a red light. The traffic signal ahead is broken. 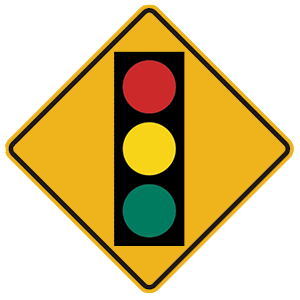 The traffic signal ahead is displaying a green light. 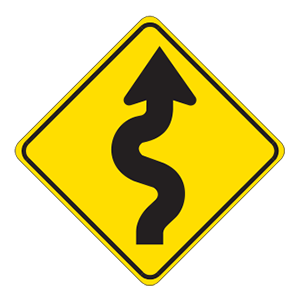 This sign indicates that there is a traffic signal at the intersection ahead. Communicate with other road users. Ignore other drivers on the road. Drive only on side streets and back roads. Avoid driving during rush hour. Crashes often happen because one driver does something that other road users are not expecting. You should communicate with other motorists, bicyclists, and pedestrians by doing things like signaling when slowing down, stopping, or changing direction. Use your emergency signals or horn when appropriate. When it has been raining for an hour or more. The day after it rains. For the first 10 to 15 minutes of a rainstorm. Right after the rain has stopped. Pavement can become very slippery within the first 10 to 15 minutes of a rainstorm because the rain causes oil in the asphalt to rise to the surface of the road. This problem becomes even worse in hot weather. The heat combined with the water causes more oil to rise to the road surface.